Narrators are R/C Bill McManimen and P/DEO Jim Heckman from Main Line Power Squadron. Traditional and electronic methods of navigation will be presented. 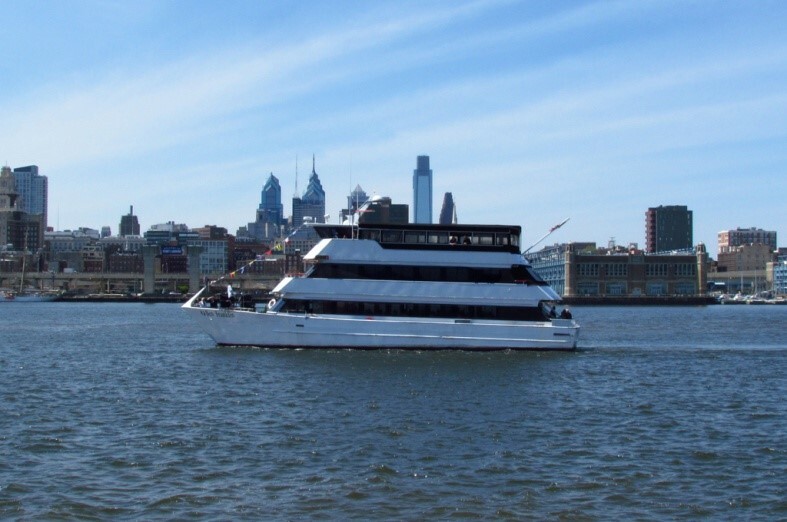 During this trip you will enjoy a delightful, full course dinner on the lower dining deck of the Ben Franklin. The informative and exciting narration by Jim and Bill will focus on aids to navigation, piloting, and chart work using a hand held compass, GPS, and plotting our position on Delaware River Chart 12312. On the return trip you will see lighted aids, ranges and navigation lights on the big ships. We will have tickets available at the April and May Delhigh meetings. Directions: The Ben Franklins departs from 401 N. Columbus Blvd. which is just north of the Ben Franklins Bridge. South on I-95: take the right hand lane at exit 22 for Callowhill St. At the bottom of the off ramp, turn left on Callowhill St. and go several blocks. Turn left on N. Columbus Blvd. You will almost immediately come upon the parking lot at #401 where you will find ample parking. Coming north on I-95: use exit #20, turn left onto Columbus Blvd. Parking lot is just north of Dave & Buster’s Restaurant.